All cat owners living in Utah, USA really must read this article because I believe they will find it shocking and enlightening. I certainly did which is why I am writing this article. Let the figures be a warning. The infographic below says it all but I add some detail below it. The shocking element of this infographic is the conclusion which I came to using simple maths, that over 300,000 domestic cats in loving homes (I hope) are in constant pain, or at the very least discomfort, from the declawing operation that their owners had put them through. Sammy is a black cat who had a great influence on Dr Doub DVM (Paw Project State Director). She met him while conducting a study. Dr Doub has her own x-ray machine and uses a pain assessment test. Sammy was in the first group of 5 cats that came to Dr Doub as part of the study. Sammy was a very frightened and fractious cat. His paws clearly hurt and the doctor describes him as an “emotional mess”. Sammy was assessed as having 9 signs of pain using her AAFP pain scoring chart (a very high figure). Sammy had undergone a four paw declaw mutilation; very large P3 fragments had been left behind in the paw by a “sloppy surgeon”. There were abscesses on each toe. “P3”, As I understand it, refers to the third phalange of a cat’s paw to which is attached the claw (the “distal phalange or phalanx). The declawing operation appears to be not only badly carried out by many vets but also badly designed because it very frequently results in the distal phalanx bone being shattered leaving behind shards which cause a lot of pain and complications. Veterinarians don’t seem to realise this, or if they do ignore it, which personally I find as shocking as the statistics in the infographic above. Anyway, Sammy was treated by Dr Doub and many people, through Facebook, raised money for the treatment. There was an outpouring of sympathy which I find very positive. Dr Doub learned that, although what Sammy had been put through was shocking, it “is all too common here in Utah”. 66% is a very high and a quite horrifying figure and difficult to comprehend because, as mentioned, it results in hundreds of thousands of cats being in permanent pain and the veterinarians who carried out the operation simply don’t seem to wish to address this problem or are unaware of it. 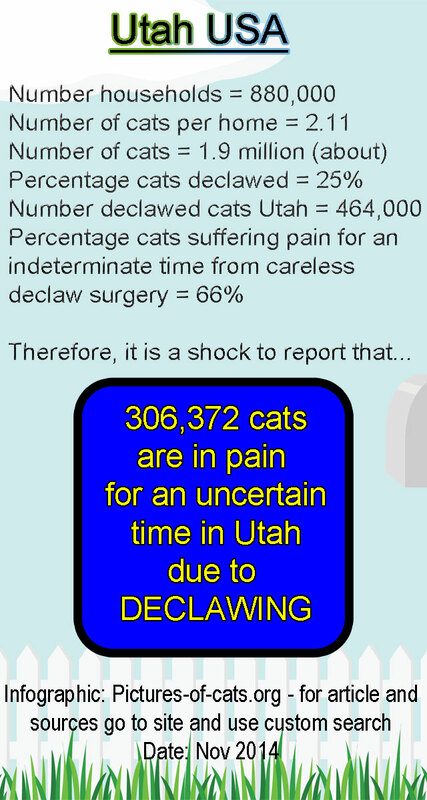 Cat owners in Utah really should think about these figures and decide seriously whether they want to risk their cat’s health and welfare when asking their veterinarian to perform the declaw operation. Don’t listen to what your veterinarian says about the operation because you probably won’t get the truth. You only get the truth from people like Dr Doub and The Paw Project and this website. If you’d like to print the graphic try this page. P.S. This page was written in November 2014. I have republished it today to try and spread the word and to keep spreading the word. It has gathered over 1000 shares. However, at the date of dictating this (late April 2018) Google does not find this page. I find that disappointing because the information on it is very important. It demonstrates the extent of pain caused by the declawing operation due to the high percentage of cats feeling pain after the operation. I am sure that nothing has happened since the page was published. There has been no change to the number of cat declawed in Utah, USA. The pain continues. It is an enormous mountain of pain about which I feel that very many people are unaware. This entry was posted in Declawing and tagged America, cat claw, Cat Declawing, declawing cats, Utah, veterinarians by Michael Broad. Bookmark the permalink. Love you brother. At least I know something valuable about declawing today. Thanks Michael for this information. Thanks Kucing. Please spread the word so we can try to stop this legalised cat abuse. Great article Michael especially the infographic. I’ve learned that when trying to dissuade people from declawing some of them don’t want to read a lengthy article explaining the truth, but those numbers jump off the page and can’t be so easily ignored. I think like you Michele. I try and present this information is a easy to digest way. Almost instant information. I also try and rework information so it has impact. This culture of declawing needs this approach. It is ingrained. Yes PoC always tells the truth. I’ll be sharing this article with the facebook anti declaw groups. Thanks Ruth, because this is shocking really. It should (but won’t) force some vets to rethink. Yes it’s shocking that many vets continue to declaw cats even with all this evidence of the suffering it causes. They should be ashamed of their cruelty and their greed for making money out of the mutilation of cats. Amen from me too. If the vets ignore this they should all be removed from the veterinarian register and it’d be time to re-educate with new vets.